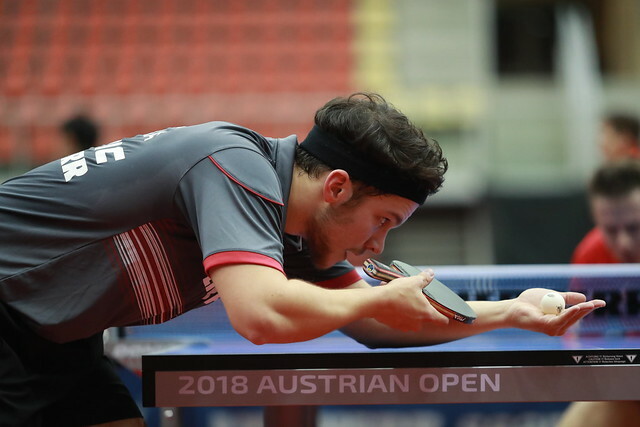 Places in the forthcoming Grand Finals on offer, on Friday 9th November at the Seamaster 2018 ITTF World Tour Platinum Liebherr Austrian Open in Linz; Germany’s Timo Boll and Japan’s Koki Niwa made significant strides in their quest for invitations to Incheon in December. Both emerged successful in their second round Men’s Singles encounters, both beat players who had been required to compete in the qualification tournament. Timo Boll, the no.3 seed, beat China’s Zheng Peifeng (10-12, 8-11, 12-10, 12-10, 11-3, 11-8), Koki Niwa, the no.10 seed, accounted for colleague Kazuhiro Yoshimura (11-9, 11-7, 11-6, 12-10). Defeat for Kazuhiro Yoshimura, who started the tournament in the no.19 spot (266 points), means he is now out of the reckoning for a place in the Grand Finals. However, following second round success, Koki Niwa now moves into 15th position (388 points), Timo Boll one below (363 points). The nearest possible challenger is Liam Pitchford. He started proceedings in the no.36 spot (137 points) but to make any impact, the Englishman, who recorded a second round win in opposition to fellow qualifier, Japan’s Koyo Kanamitsu (6-11, 11-3, 13-11, 11-7, 11-8), must reach the final. Success for Liam Pitchford in a contest against a fellow qualifier, it was the same for China’s Liang Jingkun; he overpowered Chinese Taipei’s Lin Yun-Ju (6-11, 11-8, 10-12, 11-7, 12-10, 11-6). Meanwhile, in the remaining second round Men’s Singles contests, China’s Fan Zhendong and Xu Xin, the respective top two seeds, stamped their authority on proceedings; both ending the hopes of qualifiers. Fan Zhendong beat Japan’s Jin Ueda (9-11, 11-4, 11-2, 11-4, 11-4), Xu Xin ended the adventures of India’s Sathiyan Gnanasekaran (11-1, 11-7, 7-11, 11-2, 11-4). Defeat for Jin Ueda but one Japanese name remains, as does that of one Brazilian; a player who seems to have a penchant for overcoming adversaries from the Korea Republic in tense full distance duels. Tomokazu Harimoto, the no.8 seed, beat colleague Jun Mizutani, the no.12 seed (11-6, 11-5, 9-11, 11-8, 11-7); Hugo Calderano, the no.11 seed, the previous day having ousted Park Ganghyeon in seven games (12-14, 11-9, 11-13, 7-11, 11-4, 11-8, 11-7), repeated the feat against Jang Woojin (12-14, 11-6, 11-8, 9-11, 11-8, 5-11, 11-7). At the quarter-final stage Fan Zhendong meets Koki Niwa, Hugo Calderano opposes Liang Jingkun; in the lower half of the draw it is Timo Boll versus Liam Pitchford, Xu Xin against Tomokazu Harimoto. The contest between Timo Boll and Liam Pitchford, as well as that involving Hugo Calderano and Liang Jingkun will be played later in the evening; the remaining quarter-final matches will be played on Saturday 10th November.